For decades, global development has been one of the great foundations of the liberal international order’s legitimacy. Its ideal is an international community bound by common rules and multilateral institutions, which create the foundation for shared growth. In practice, it presents itself as embodying this civilized norm while treating its enemies as violators of this international peace. Moreover, economic and political liberalism are tightly intertwined. Political orthodoxy from World War II onward held that growing wealth should secure liberal institutions, democratic norms, stability, and happiness. This vision has been criticized on a variety of grounds: interventionist wars, pragmatic ideological hypocrisy for select allies, and the use of development loans to advance aggressive free trade are but a few examples. Nevertheless, it has not been seriously threatened since at least the Cold War. However, that world order is now gripped by a crisis of contradictions. Since the financial crisis of 2008-9, returning growth has accrued mainly to a small portion of the population in both the United States and other countries. Real wages appear stagnant, institutions are unable to deal with growing population flows, and populist movements are overturning prior certainties. Not coincidentally, this has coincided with growing interest in an alternative path of development. As China has become more globally influential, developing economies have courted its investment, and examined its policies as an alternative model. But without a doubt, the appearance of the Belt and Road Initiative in 2013 and its subsequent promotion have increased the competitive edge of the Chinese development brand. If successful, the project will develop economies across Asia, Europe, and Africa, and accelerate the integration of a Eurasian supercontinental economy. The “belts” will be a number of land-based infrastructure corridors, while the “roads” refer to sea routes. Around 70 countries were involved at the start of 2018, representing over a third of global GDP and the majority of the world’s population. For the first time since the Soviet dissolution, the liberal order is faced with an external power offering both a competing vision, and the geopolitical clout to gain cooperation. Several questions arise from this situation: what is China’s idea of a successful Belt and Road, and what are its implications? How likely is this new model to out-compete the liberal order and its norms? How can we measure such a thing in an interconnected world? Much of Western China-watching has been done through the lens of Western concepts. For example, Chinese development is characterized as being the result of “state capitalism” — in other words, by China’s tacit acceptance of a distorted liberal capitalism. But this method has serious pitfalls. The Chinese Communist Party (CCP) places great store in maintaining and demonstrating continuity in its thinking; the role of theory has always been central. Both Deng Xiaoping and Xi Jinping presented their official contributions to CCP theory as developments of prior stages of thought, ultimately linked to Mao’s adaptation of Marxism-Leninism. It is difficult to understand the CCP worldview without this underlying framework of theory and development. Critics will question the extent to which official ideology, as taught in universities and used in slogans, actually reflects the CCP inner doctrine. That distinction is important; public expressions of ideology are not necessarily the whole story. But China has demonstrated a deep and continuing commitment to crafting its own vision of how economic and political development should work. The West should not forget that the CCP took Chinese political and ideological sovereignty seriously enough to spurn their own Soviet allies. It would be a mistake to infer from convergence on policies like the use of markets that China has abandoned these commitments. Though Chinese thinking changes and updates, it should not be assumed that all ideological roads lead to Washington and Brussels. The Chinese vision should be examined on its own terms in order to understand the political foundations of Belt and Road. It cannot be overstated how intensely aware China is of the Western narratives surrounding its rise. As a result, its public relations approach with Western countries has traditionally been to emphasize cooperation and downplay its power. However, the shift from Deng-era cooperation to Xi-era self-assertion has led to more public criticism of Western narratives as well. A good example of attacks on the “state-capitalism” narrative appeared in 2018 via the state-run China Daily. Speaking in the context of the U.S.-China trade war, the paper accused the U.S. of using the term to cloak its use of free trade ideology as a tool of power on the international stage. Meanwhile, it pointed out that the West benefited from protectionist policies during its own development, and from use of state intervention in times of crisis. Given this apparent hypocrisy, it cast Western narratives about unfair Chinese state-capitalism as weapons in a geopolitical struggle to subvert China’s rise. The understanding of economic power as the basis of political power is a foundational Marxist concept, perhaps giving some weight to Xi’s comments that China has not abandoned Marx. By the same Marxist principle, however, the economic power which Belt and Road is intended to create also has political consequences. A system where China is the center of economic gravity is one where China is the center of political gravity. By making itself the driver of a large development region, its strength in economic conflicts (such as the current one between Beijing and the Trump administration) would increase. Most observers have made this same link, a fact of which the Chinese leadership is well aware. While it has emphasized the economic benefits of Belt and Road, it hasn’t overlooked the fact that an adjacent political language is needed. Particularly important is the “community of common destiny” idea, which has become central to the Belt and Road political brand as well as official Xi Jinping Thought. The idea combines notions of a peaceful Chinese rise, mutually beneficial cooperation, and common stakes in the future. It has been promoted mainly in developing countries where China has established relationships. In the context of Belt and Road, it represents China’s preference to emphasize a shared, cooperative political order rather than a confrontational one which could undermine its international ties. This raises the key question: will Belt and Road come through? Political goals are all well and good, but amount to nothing unless the project can actually fulfill its promise to be an engine of economic development. One of the major analyses of the project’s overall economic logic has come from Portuguese politician and business strategist Bruno Maçães. Basing his work on personal experience in the region and feedback from Chinese experts, he identifies Belt and Road’s key economic component as its impact on global value chains. Maçães has emphasized China’s focus on cheaper production prices in regions like central Asia, as well as the advantage it would gain by being the first to establish facilities there. China will be able to offshore parts of the development chain in the same way Western powers once did. This will allow it to focus domestic resources on areas where it has a comparative advantage. Such a policy couples well with the Chinese focus on developing its service industries and high technology sector. With Belt and Road, the opportunity arises for China to both increase the resource base it has access to and the profit margins derived from its use. In a country where the economic and political orders are intertwined via both state-owned enterprises and more indirect controls, this stock of net wealth will increase the strategic resources of the state. Maçães points out in his analysis that the focus on land routes makes more economic sense than a first glance suggests. Despite higher transport costs compared to sea routes, the scale of the Belt and Road project will provide value to land-based value chains, as well. China envisions expanded transportation and routes connecting a number of growing economies in the region. Of course, the creation of new economies will also benefit China politically. This demonstrates another aspect of what it means to out-compete the liberal order: yet-undeveloped regions in the world building wealth in a Sinocentric infrastructure and trade network rather than a Western-centric one. The access to great spaces across which production can be ordered and re-ordered is key to development. 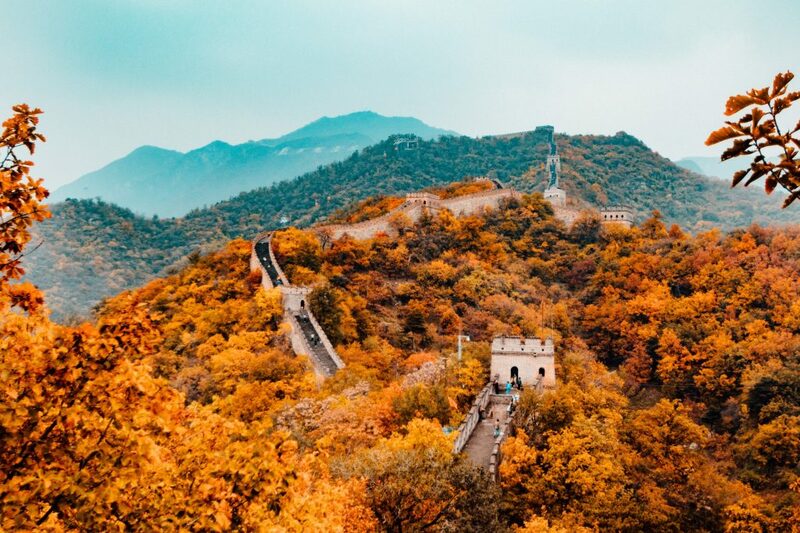 Both Europe and the United States were able to build up such spaces during the 19th and 20th centuries—including territories within China itself. It is vital to recognize that beyond Belt and Road’s initial projects also lies all the potential opportunity and innovation which accompanies rising economic spaces. As the steward of the Belt and Road infrastructure, China would be in a strong position to benefit. While the breadth of the project often makes it appear ad hoc, its major components follow a sound economic logic. In all this, China is no different from its Western rivals, who have benefited from access to economies across the globe. While the age of empire and trade backed by colonial arms gave way to the liberal era of free enterprise, the fact remains that such large-scale access has been essential to building Western wealth and power. The wars in Afghanistan and Iraq, and realpolitik alliances with deeply illiberal countries like Saudi Arabia represent that interest at its most undisguised. However, the rhetoric of liberalism did allow the West to present its great space as being founded on voluntary cooperation. Similarly, the rhetoric of “common destiny” demonstrates that China wants to minimize the political tensions generated by its new economic sphere. Moreover, the investments and debts that countries are taking on to be part of the project mean that they will have political incentive to remain committed, even if some particular projects fall through. This means that the relationships involved are intended for the long-term. The main question is what set of rules will govern the way these chains are organized. The Chinese model is to conduct this organizing process as much as possible at the political level, through agreements reached directly between national governments. Most large Chinese multinationals are not simply state owned but are effectively managed with a view to goals and strategies defined outside the company and through political channels. When the EU reduces its reaction to the initiative to the technical issue of linking European and Chinese projects in a connectivity platform designed to enhance economic synergies, it is ignoring the deeply political question of what model of Eurasian integration should prevail, or what combination of different models can be agreed on. For example, while Chinese authorities often speak of a principle of noninterference, they mean noninterference in the state’s ability to pursue collective goals, rather than the liberal notion of noninterference in individual life plans. Separation between the economic and political realms, while often nominal, defines much of Western politics and therefore the developmental assumptions of the liberal international order. From 1945 onwards, the liberalism of Western countries was founded on the rights-bearing individual as citizen of a civic state. Social democratic governments focused on providing economic support; meanwhile, conservatism after Thatcher and Reagan was prone to seeing government as an obstacle and wealth-building as the job of the private sphere. Despite these internal disputes, the overarching vision has been one which minimizes ideas such as collective identity and the state. While its advocates have seen this as essential to protecting liberty and equality, these tendencies have also prevented governments from properly addressing issues such as growing class inequality and cultural tensions resulting from mass immigration. With populist movements rocking the West itself, it should not be surprising that other countries are questioning whether the liberal ideological foundation is necessary for development. Of course, different regions have different motivations for considering the Chinese alternative. For African countries such as Nigeria and Ethiopia, rapid large-scale investment is appreciated, and special economic zones have provided spaces where local institutional failures will not undermine growth. For Eastern European countries involved in the 16+1 Initiative, which includes Austria plus a number of post-Soviet sphere countries, a Chinese relationship will help to balance pressures from Brussels and Moscow. China’s lack of ideological demands for membership in its projects also give it greater flexibility in negotiating with potential partners, which demonstrates yet another aspect of what it looks like for China to out-compete the liberal order. If China is better able to match the political desires of developing states, the West will have to either relax its political demands or increase economic benefits in its own agreements. In other words, it will be engaged in increasingly direct competition in a way it has not been since the Cold War. However, it is clearly not enough for the West to make window-dressing adjustments to existing norms. The logic of Belt and Road itself makes clear that there is only one guaranteed way to ensure a fair balance of political power. Countries partnering in the project will have to maximize influence by leveraging their economic clout to the highest possible degree. The goal should be a Belt and Road reality in which participants are in a position to ensure that the project’s political values and norms are not a Chinese monopoly. In this light, it is vital to understand which rivalries Belt and Road has the potential to reinforce. Without a doubt, the major Chinese rivalry is with the United States. While U.S.-Russia relations have been more heated and perhaps more openly adversarial, the U.S.-China relationship is that of two economic superpowers. The trade war begun by the Trump administration has brought this into the open. China hawks in the U.S. point to the large American trade deficit with China, and heavy U.S. strategic dependence on Chinese supply chains. However, the U.S. is not the only player in this economic game. The EU has generally been viewed as a quieter observer focused on maintaining diplomacy. But despite continuing talks about strengthening trade relations, Europe is simultaneously working on its own plans to expand transit and investment in Eastern Europe and Central Asia. However, this is balanced out with European interest in Belt and Road involvement, particularly in the European east. China has an opportunity to gain influence in the eastern region, but likewise Brussels has an opportunity to add its clout into negotiations. This will depend on how continuing west-east disputes in the EU itself play out. For the West to retain advantages, grand strategy would be necessary. Two questions immediately arise. First, how would countries get involved in such a strategy? And second, what about areas where rivalry is growing, such as the African continent? Regarding the first question, Maçães recommends that Europe make the balance of power a key part of negotiating positions. In particular, he points out that European and other foreign companies are often locked out of Chinese markets in a way that Chinese firms are not in the West. Furthermore, he states that Western governments would have to ensure some degree of autonomy between the economic and political powers. In this, Maçães is in fact fairly well aligned with the Trump administration’s goals, if not with its means. In addition, Western countries will have to counteract foreign influence within their borders, if they are to play this game. Canada’s intelligence agency has previously warned that Chinese influence has compromised politicians in Canada and New Zealand. Politico recently ran a feature showing the extent to which Chinese intelligence has penetrated Silicon Valley. On the other hand, China has quickly identified and killed CIA informants operating in its territory, crippling U.S espionage operations. [A]s European colonialism recedes into the past, that identifying trait of not being European disappears as well and perhaps we will see Africa fracture a bit. I can imagine many different Africas—five, six different Africas, that, by the way, have very little in common with one another already, and may have even less common with each other a few decades from now—that’s one possibility. It’s entirely possible—and let me speculate a little bit—that Africa will come under the influence of different superpowers, it may already be true to some extent that East Africa is under deep Chinese influence—very obviously in Ethiopia—and then West Africa is more under the American influence, simply because of the facts of geography and even history. Western countries may be able to ensure an economically beneficial Belt and Road, while exerting influence on its political norms, by taking the above sorts of measures. We will see. A failure scenario would be one where Western influence is insignificant to the Belt and Road outcome. In this case, the West may find itself out-competed in three different areas: First, it may find itself displaced in terms of the norms of international relations and development. Second, the economic infrastructure of development itself may be increasingly under Chinese political control. Finally, the sorts of deals offered by China may become more desirable by virtue of their adaptability to different cultures, regions, and political regimes, as compared with Western ideological demands. The reality is this: in a time when the Western model has become further delegitimized by its internal crises and foreign policy troubles, extensive rethinking is necessary in order for it to compete in these fronts. Involvement in projects like Belt and Road, as well as alternatives for countries which see the benefits of diverse investment, will help to maximize the Western role in setting norms. However, the reality is that a world with many advanced powers is one in which a monopoly on norm-setting is gone. The new global landscape is one where Western countries must learn from their neighbors, just as those neighbors have historically learned from them. This means that it must work all the harder on the second and third fronts. The Western approach as of now has still been to focus on free trade agreements. This set of policy tools will need to be expanded. While Western companies have benefited from special economic zones, there is a lack of comprehensive strategy from Western governments. Increased diplomatic and institutional assistance in the creation of special economic zones will help to accelerate wealth creation in countries where overall institutions are fragile. Moreover, a rethink of what is demanded ideologically from international partners is in order. Demands that such partners ensure security, rule of law, and common dignity are obvious, but the nominal presence of liberal democracy is no guarantee for those provisions, as we see in countries like Iraq and Haiti. Meanwhile, the governments of the United Arab Emirates and Hong Kong attract Westerners, despite its absence. While the liberal idea has shortfalls, it also has also provided insights. Trustworthy institutions and a set of norms where individuals have the freedom to innovate, as well as the expectation to benefit from that innovation, are valuable. In a future where the West no longer enjoys a monopoly over global norms, institutional experience in creating these environments will contribute to Western comparative advantage. Nevertheless, there is no guarantee that governments will pursue this path. Deep divisions persist across the Western world, such as in relations between Brussels and the countries of Eastern Europe. Where populist governments have gained power, the long-term agreements and norms they will create are still in flux and uncertain. As things stand at present, China enjoys a strong advantage in implementing Belt and Road on its own terms. If this occurs, then the results will expand Chinese power and amplify its voice in the establishment of global norms. The economic foundations will allow China to create strategically useful value chains and have the dominant voice in a regional sphere attractive to both investors and countries with developing economies. Its model will have greater proofs to point to and an increasing legitimacy. If the Western bloc is still bogged down in crisis, the contrast will be stark. In this scenario, we will indeed have to confront the reality of being out-competed in key strategic spheres. Only a West which has resolved the strife of class and cultural conflict will be able to coordinate effectively. The new rulebook which arises as a result of these resolutions may well aid its future competitive position. This makes it ever more vital that we find a path which can lead the Western world out of its current strife.